 Tanklok BR 75.4 10-11 typ DB "Merry Christmas"
By buying this product you can collect up to 19600 bonuspoints. 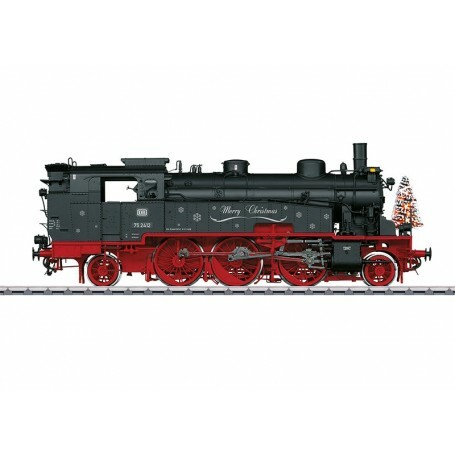 Tanklok BR 75.4 10-11 typ DB 'Merry Christmas', längd över buffertar 39,7 cm, epok III. Model: The locomotive frame and body with boiler is constructed of die-cast zinc. Other separately applied parts are mostly made of metal. This is a highly detailed model with many separately applied details (brass) and a detailed engineer's cab. The locomotive has a bell separately applied behind the smoke stack, it has a raised addition to the coal bunker made of metal, a shortened smoke stack, a smoke box door without a central locking mechanism, a water tank hatch that can be opened, a sand dome that can be opened, cab doors that can be opened, and much more. The locomotive has an mfx digital decoder, controlled high-efficiency propulsion, and a sound generator with operating sounds synchronized with the wheels as well as extensive sound functions. The locomotive can be operated with AC power, DC power, Märklin Digital, and DCC. 3 axles powered. The locomotive has a built-in smoke unit with smoke exhaust synchronized with the wheels, cylinder steam, and a steam whistle. The locomotive has triple headlights that change over with the direction of travel and have a light color correct for the era. The headlights will work in conventional operation and can be controlled digitally. Maintenance-free warm white LEDs are used for the lighting. Cab and firebox lighting as well as running gear lighting are included. The special light function is a Christmas tree with LED lighting that can be controlled digitally. As a special sound function, the locomotive whistles 'O Tannenbaum' and 'Jingle Bells'. The locomotive has a prototype reproduction coupler on the front and a claw coupler on the rear. Both can be changed to the other type of coupler. An accessory package with a prototype reproduction coupler and a claw coupler, smoke fluid, and figures of an engineer and fireman is included with the locomotive. Minimum radius for operation is 1,020 mm / 40-1/8'. Length over the buffers 39.7 cm / 15-5/8'. Highly detailed full metal construction. Frame, superstructure, boiler, etc. constructed of die-cast zinc. Running gear lighting.Engineer's cab lighting. Special sound functions of steam locomotive sound 'O Tannenbaum' and 'Jingle Bells'.